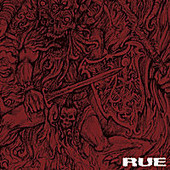 Some might describe the self-titled CD by RUE as "stoner" metal. I've never liked that term, but for this album it might be more accurate than usual. Not because you have to be stoned to appreciate RUE, but because this is so hard hitting and crushing that it is like having a bus sized stone fall on your head. A violent image, no doubt, but an accurate simile nonetheless. Fans of the stoner and sludge scenes are going to eat this sucker up. RUE's specialty is mid-paced harshness that brings to mind none other than the mighty BRAINOIL. When you hear music this unforgiving and devastating you know it has to be on Southern Lord Records, Life is Abuse Records or Shifty Records. The winner this time being Shifty. Go. Buy. Now.